“PC is 2007 bought from new. It’s an Advent with a 250gb hard drive. Worked fine shut down last week, turned on 2 days later Windows wouldn’t boot up, or go into safe mode, all auto repairs didn’t work. Used the back up made on purchase to boot from cd rom. tried all 4 repairs options from the menu. did a bcd backup command bootrec and tried to fix by following instructions online. Hi and thanks for your enquiry – to answer your question, yes it is a hard disk issue. 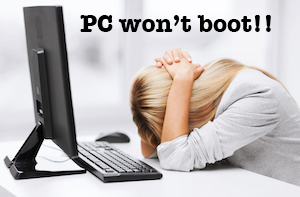 When a PC encounters boot problems it will go through a chain of procedures in order to try and boot the PC. The good news is that no ticking or beeping noises are coming from your PC which tell us that mechanically the hard drive is still sound. Similarly the hard drive is still being recognised by the PC’s BIOS, so it’s not electrically faulty either. Broadly speaking this leaves two main options, either (a) the data structures on the hard drive are corrupt or (b) some parts of the hard drive have become unreadable – a problem known as bad sectors. The older the hard drive, the more common bad sectors become and as your PC is 10 years old, you’ve done extremely well for it to last so long without going wrong. Once a hard drive starts to develop bad sectors it’s best to change it as bad sectors do not get better, it’s a terminal problem and eventually your hard drive will die. Therefore the best thing to do is to transfer your data to another (newer) hard drive. 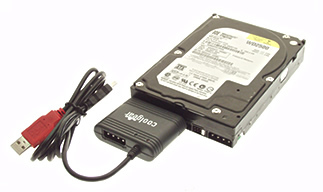 As your faulty hard drive is also your boot drive, the best (and cheapest) way of getting your data off is to remove the faulty hard drive from the computer and attach it as an external hard drive to another computer. You’ll need a hard drive USB adapter to do this (you can get these from Amazon here). This will circumvent the booting problem (as you’ll be booting from another PC) and your should be able to drag and drop the files you want to save across to the new hard drive.